We’re Not the Only Ones Saying It…. » Embroidery Talk Has Moved! We’re Not the Only Ones Saying It…. Those of you who read this blog on a regular basis know that I’ve written about our metallic thread in the past. Back in December, I talked about our great selection of accent threads. In September I wrote about an awesome embroidered jacket back that was embroidered entirely with our colored metallic thread, created by a good friend of EnMart, Black Duck Inc. In August, I talked about how our metallic thread was the cure for the metallic blues which afflict so many embroiderers. The list of the posts I’ve written about our metallic thread could go on and on, but although each post has a different slant on the subject, they all end up mentioning one thing: our metallic thread is one of the best in the business. Those of us who work for EnMart, who’ve worked with the thread, and who sell it, have talked about the qualities of this thread a lot. We tell people it runs better than the other metallic threads on the market, that it has less thread breaks, that even if someone is dedicated to metallic thread avoidance, Iris Dazzling Metallic thread will change their mind. We had out samples at trade shows and tell those who take them to give it a try and then give us a call and let us know how great the thread runs and how easy it is to use. Those calls do come, or we see a person who took a sample at a previous show at another show and they tell us in person how great the thread runs and how much they love to use it. That, of course, is something we always love to hear. 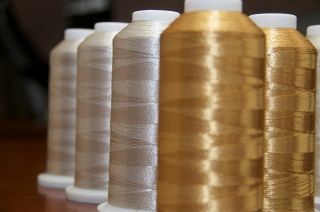 We also love to read positive comments about our metallic thread. That’s why it was so great to get the following comment on a post I wrote about the DAX Minneapolis show. Saw you at the Dax show, Picked up a sample of metallic thread. Did a sew out today, BEST sewing metallic I have used! I’m aware that we can talk about how great our metallic thread is and how well it sews and how easy it is to use and, for some people, that will just sound like another round of sales talk, and be taken with a grain of salt. The comment on the blog, however, is an unsolicited testimonial from someone, just like those of you reading this, who owns a machine and got a sample of Iris Metallic Thread to try. If you’re skeptical about metallic thread, or have had a bad experience in the past, I encourage you to do what the person who left the comment did, and give a sample of our Iris Dazzling Metallic thread a test run. I’m sure, if you do, you’ll soon be sending us a positive comment as well. This entry was posted on Wednesday, March 30th, 2011 at 10:44 am and is filed under Hilos Iris, Thread. You can follow any responses to this entry through the RSS 2.0 feed. Both comments and pings are currently closed. You are here : Home » We’re Not the Only Ones Saying It….